I am truly not that picky about tofu and am happy enough to eat it right out of the plastic container. Or boiled, which sounds sort of British but I guess is sort of not. I remember my dad objecting to being served cold tofu, I wonder now if boiling tofu wasn't my mom's version of a Kobayashi Maru. There, it's hot. I WIN. Or is that actually a way that Koreans cook tofu. I am without referents, which is what happens when your dad alienates his entire family and you grow up thinking that you're the only Korean family in the world. Also the only Seventh Day Adventists in the world. Let there be no doubt that I am my father's daughter, though. Why not fry tofu in a waffle iron? It's square so the pieces fit better, and you can fry both sides at the same time; the hotplates are reversible, griddles on one side and waffles on the other. I googled this recipe for dry fried tofu, and it says not to use oil. So also, it's a non-stick waffle iron. And the weight of the iron presses the tofu as it cooks, if you're into that. Though I'm not hysterical about pressing tofu to make the texture more like meat, I like tofu the way it is. Aw. Heat the waffle iron to medium. It takes a while to heat up. If you're making lunch boxes, put the rice on now. Slice each block of tofu crosswise into quarters, and pat the slices between paper or cloth towels. When the iron is hot, lay the slices on the bottom griddle and close the top griddle as evenly as possible over the slices. I put my cast iron frying pan on top of the waffle iron to press the tofu, and it did press out quite a bit of water that very neatly ran out that little spout on the lower right. You pretty much just walk away at this point, let the tofu cook until it's browned. Maybe twenty minutes? When you think the tofu is done, open the waffle iron. There may be a moment where you think that you glued your waffle iron together with tofu, but just gently pull it open. 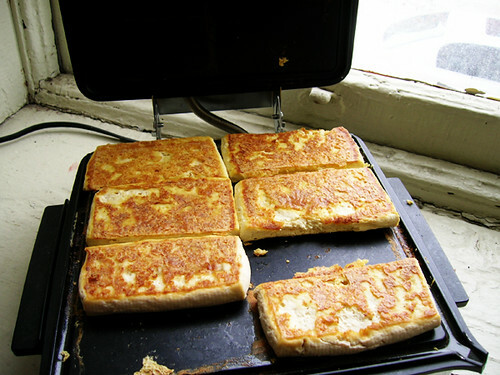 Use a heat safe rubber spatfula to unstick the tofu slices from the griddle. Supposedly now you marinate the tofu and make it into stir fry, but I barely have the patience to cook something once. I don't hardly have the patience to cook anything twice. Which is too bad sometimes, because I really like potato skins. So I just put some rice at the bottom of my lunchbox and lay a slice of tofu on top, and it's enough rice and tofu for eight lunches. The cucumbers go into a separate container, recipe tomorrow.